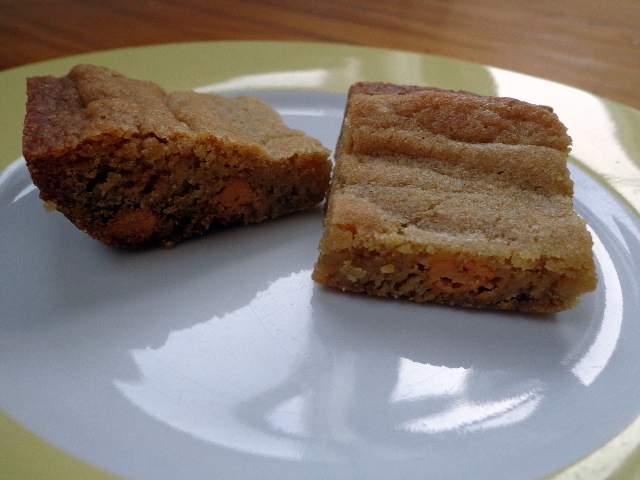 Inspired by my Buttered Rum Raisin Cookies, these blondies are where it’s at. 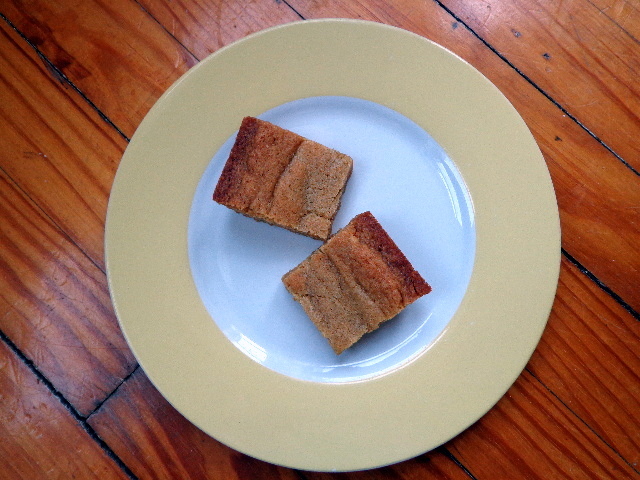 The buttery blondie dough is studded with Heath pieces and butterscotch morsels. The texture is chewy but still melt-in-your-mouth. The flavor is butterscotch, cubed. Preheat oven to 350 degrees Farenheit. Prepare a 9×13 inch dish with baking spray. In a skillet over medium-high heat, brown 11 Tbsp of butter. Melt the butter, swirling the pan to keep it from burning. Browning should take 2 – 3 minutes; when the butter is a deep brown and starting to smell delicious it’s done. Gently stir flour and baking soda into the butter-sugar mixture. Fold Heath pieces and butterscotch morsels into dough. Pour dough into prepared baking dish and smooth into the edges of the dish with a spatula. Bake 30 minutes, until lightly browned and starting to pull away from the edges of the dish. Allow to cool before slicing if you want neat squares.